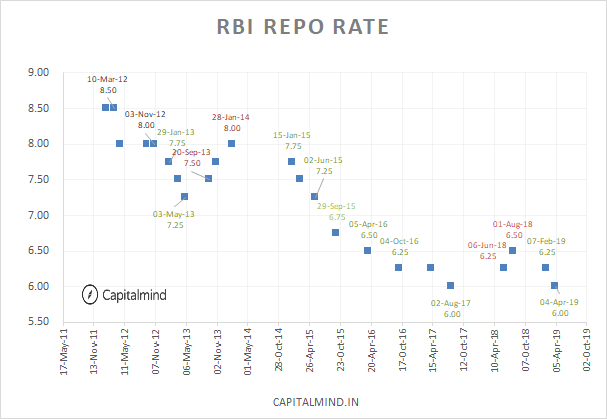 RBI cuts the repo rate today by 0.25% to 6%, the lowest it has been since 2010 (it was at 6% in 2017 too, for a while). This isn’t the lowest though – in 2008-10, we saw repo rates fall to 4.75% for a while and after that things have been strongly on the upside. But Why Did Markets Fall? The RBI has said it believes inflation is lower in the next nine months, than anticipated. Meaning, they expect a max of 3.8% by March 2020. That’s not high, one would think. However, they said there some risks of all sorts, including government stupidity, OPEC silliness in attempting to increase fuel prices, some base effects on vegetables, and some reference to El Nino predictions. This looks like an excuse to fill words in a document. The RBI maintained a neutral stance to monetary policy. Our policy at Capitalmind is : Look at what people do, not what they say. The RBI is adding liquidity at a brisk pace, buying rupee bonds, buying dollars, doing swaps. 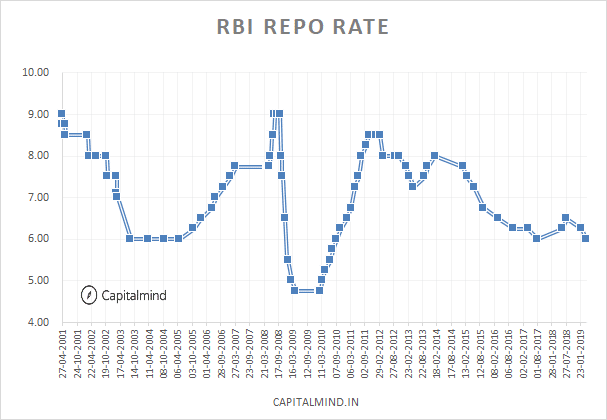 They are reducing repo rates. Their stance, whatever they may say, is actually accomodative. As much as they keep saying they are neutral, their actions show they are accomodative. The markets needed an excuse to correct, which they got by looking at any random interpretation of the above. So Will There Be Inflation? Is RBI Good At Predicting It? RBI seems to be biased towards the upside. We took the last two years of predictions by the RBI and overlaid it on a chart of how the inflation actually panned out. 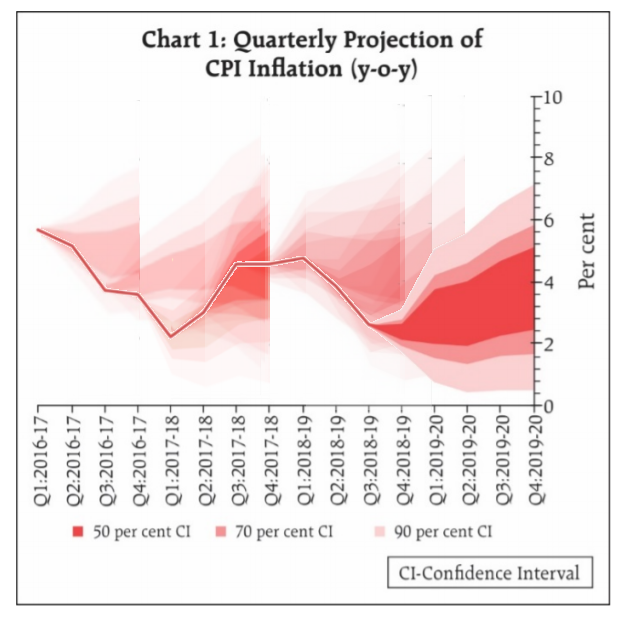 Turns out the RBI has mostly erred on the side of higher inflation predictions. They may be right when inflation does increase, but when it decreases they are horribly wrong. The thick red line is actual inflation. The blurry areas are past predictions at different times. In our view this is yet another policy. The rate cut is very good. Banks will not pass it on just yet, because they are mostly people in suits whose primary job is to fleece you out of your money, so you can’t expect very good behaviour in interest rates. For this, banks will crib and complain about how the rates don’t reduce their cost of capital – because most of their money is in current accounts/savings accounts which are so far below the policy rate that the cut doesn’t matter. They also need deposits but that’s been getting cheaper to obtain from abroad now. However, we expect the rate cuts to happen from banks only after the government cuts small saving rates (PPF, Post Office Deposits etc) for non-senior residents. Also, the rates in the commercial markets have been falling in the last two weeks as well. The rest of the policy was not very relevant, but we shouldn’t expect it to be. With elections coming up, there could be a change of scene in the next two months, and then there’s a budget in four months. Those will determine the course of RBI policy. At this point, our view is that if inflation continues to stay low, we will keep getting rate cuts.